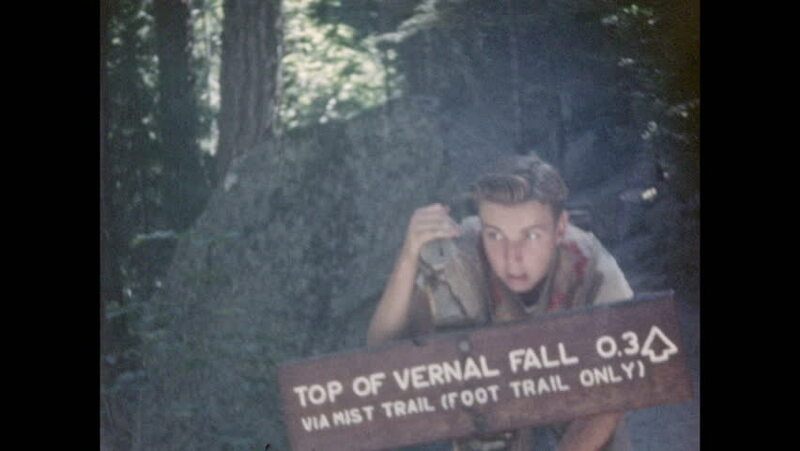 1940s: A boy poses behind a sign with text "Top of Vernal Fall". Two squirrels move on the ground. Vernal Falls at Yosemite National Park. hd00:291960s: UNITED STATES: Don't Expect Perfection title. Baseball players on field. Consider Only Important Differences title. Weigh Alternatives title. Lady sits in office waiting room. 4k00:191940s: Close up of elderly woman. Boy and girl posing, boy pushes girl. Pan across women and children posing. hd00:171950s: book pages turn from portrait of Sir Benjamin Thompson, Count Rumford to diagrams of observation device and a box. drill bores hole into piece of metal. hd00:201940s: Teacher writes on chalkboard. Teacher and students look at map on table. 4k00:181920s: Diving men swim up to glass panels on bottom of glass-bottomed boat. Men surface from diving and go underwater again. hd00:301950s: Girl sits at teacher's desk in classroom. She grabs books and stands up. Girl walks up path in snow to house and walks in front door.